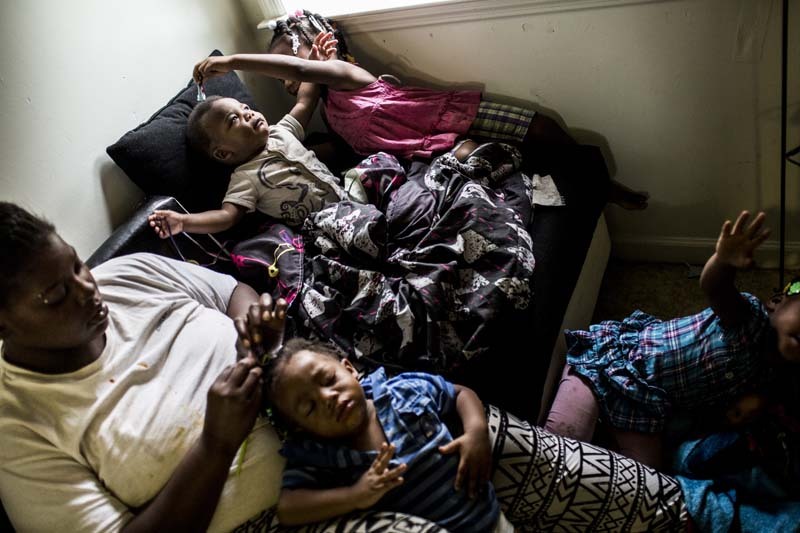 September 17, 2014 - Lucie Slater braids her nephews hair while watching her two-year-old daughter along with her sister's children in her unit at Foote Homes. Slater dropped out of a culinary arts program in order to take care of the children. But she wants out of Foote Homes and sees a culinary degree as her ticket. �I pray every day that I won�t let my baby grow up here (Foote Homes). She�s already getting older and sees a lot. I want to move away before she understands everything that�s going on over here,� Slater said. �Me and my baby had just finished saying our prayers that night and a bullet came through the window. It was a shock to me. We had just said amen,� Lucie recounted about one evening in Foote Homes.